I had an "ah-ha" moment regarding learning theories. It is one of those simplistic realizations that you leave asking yourself why you didn't think about it sooner? One of the struggles I've had with learning theories is how the relate to one other. I think this challenge is compounded by the fact that they are always presented in a time linear model. We always start with behaviourism, then cognitivism, followed by constructivism. Each is described as an "advancement" on the other – that is, cognitivism came about because behaviourism didn't describe everything. The problem is, that although one was created after the other in order to describe something the previous thing missed, it didn't always describe things that the previous did. The creation of cognitivism didn't wipe out the concept of behaviourism, it just provided another view. In class the other day, I was having a discussion about learning, and how I agreed with Dewey in that learning occurred through communication, and that learning was related to having a common understanding. The person I was discussing this with was seeking ways to debunk this theory – that is prove it false by seeking an example of learning that occurred but could be described by the need for a shared understanding. My "ah-ha" moment was the realization that all learning theories describe "some" ways in which we learn, but not "all" ways in which we learning. Learning is such a complex concept, that it isn't really fair to expect a single theory to explain it all. This idea of some versus all helped me understand why I could relate to aspects of behaviourism, cognitivism, and constructivism and how I felt that one did not necessary exclude the other. To help visualize, I think of learning as a large square, and within the square are circles, each representing a learning theory. Some overlap, others do not. 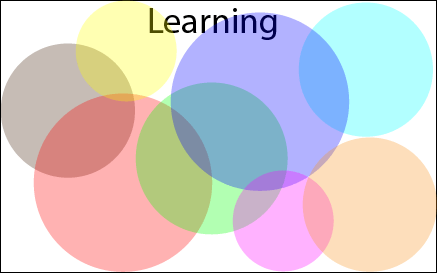 There are hundreds of learning theory circles, and yet not "all" of learning is describe by these circles. The round circles will never completely fill the square space. There will always be room left for new theories of learning. Learning is so complex, that the sum of all theories will never describe the whole. Being the big-picture person that I am, I just wish someone had explained that to me in the begining. It certainly would have made my study of learning theories go a lot smoother! Love this post and the visualization, Rebecca! Thinking seriously of assigning your post as reading material for an extended faculty workshop i am co-facilitating soon inshallah! But back to hard sciences, two interesting things in common: we still use Newton’s law on some scale, so it means it was a way of explaining a sub-domain of phenomena (so kind of a tiny circle? But at a time we perceievd a smaller square, so it seemed liek a big fish in the small pond)… Whereas now, quantum mechanics itself admits it cannot “know” both velocity and position (or some such thing) accurately at the same time, so the “same” theory is actually like two non-overlapping circles! Some circles are also sub-sets of each other, right? But do some circles completely oppose each other, when talking about learning theories? Maha, I can totally see doing a creative arts type project with cotton balls, markers, and various other supplies, asking learners to create a model of their view of knowledge / learning theory! Very interesting Rebecca. I've just been covering some of the same material as part of a tertiary teaching course (ie training to teach at tertiary level) and I agree that they address different aspects of an impossibly complex whole. On a completely different level, I really enjoyed following your tour of Nova Scotia so thanks for both intellectual and holiday insights.